Objective Preeclampsia is considered as one of the most important causes of death among pregnant women all around the world. This study aims to study the predictive value of uterine artery Doppler ultra sonography in the incidence of preeclampsia and the intrauterine growth restriction (IUGR) in pregnant women referring to the Fatemieh Hospital. 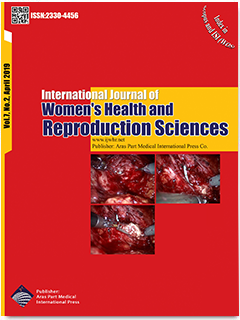 Materials and Methods: This study was performed by the prospective cohort method and the statistical population included108pregnant women with singleton pregnancy who had referred to the prenatal Fatemieh Hospital of Hamadan during 2013-2016 in 18 to 22 weeks of pregnancy. The uterine artery doppler ultra sonography was performed aspect of incidence IUGR and occurrence of preeclampsia in the followed pregnancy was evaluated in these patients. Data were analyzed using SPSS16 and also using the chi square and Mann-Whitney statistical test. Results : The mean difference of Pulsatility Index (PI) in the patients with preeclampsia was statistically significant with the healthy individuals (p = 0.001); the mean difference of PI in the individuals with infants suffering from IUGR was statistically significant compared with the infants not suffering from intrauterine growth restriction (p = 0.001).The incidence of preeclampsia and IUGR in the women reported with bilateral notch in ultra sonography was significantly greater than the incidence of preeclampsia and IUGR in the women, in whom bilateral notch has not been reported in ultra sonography (p = 0.001). Conclusion: It can be concluded that Doppler ultra sonography of uterine artery has predictive value in preeclampsia in the pregnant women.